Explore our selection of breezy and beautiful Hawaiian clothing for women today! From casual Hawaiian shirts to gorgeous halter dresses we carry a wide range of tropical styles that are perfect for sunny beach days as well as more formal tropical occasions. Premium materials ensure breathability and comfort without sacrificing the vibrant colors and gorgeous detail that make Aloha prints so unique. 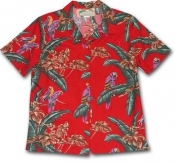 Browse Aloha shirts, Hawaiian dresses, sandals, wedges, and more below and find the perfect look for your next tropical getaway. Hawaiian Dresses, Sarongs, and More! We carry a wide range of Hawaiian dresses, each featuring vibrant colors and gorgeous prints that make them truly unique. Spaghetti strap dresses, sarong dresses, and halter dresses of varying lengths and patterns are available. Our dresses are incredibly popular for beach weddings and formal tropical events as well as more casual sunny get-togethers. Authentic materials and construction means they’re breathable and comfy in tropical conditions while maintaining a colorful tropical charm. Our selection of women’s footwear is as varied as our dresses. Classic flip-flops, stylish wedges, and colorful sandals reflect our Hawaiian origins while providing comfort and durability. Wear our women’s Hawaiian sandals to your favorite beach-side restaurant or dress them up for a destination wedding!